Trans-trax: Who wants the Irish....? Who wants the Irish road transport traffic thundering down our roads, rattling our windows and belching out fumes that asphyxiate us? Nobody in their right minds would deny that any opportunity to get rid of such traffic, to Ireland or anywhere else, would be a boon. 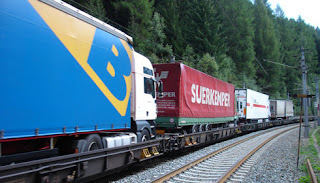 Other countries, Switzerland and Austria are good examples, have to put up with large numbers of cars and lorries that transverse their countries on their ways southwards (or vice versa). The benefit accrued by such traffic is minimal if at all. At most they might stop for a meal and fill up the fuel tanks (if worthwhile). The lorries carve up the roads while paying no local taxes for the upkeep of those roads. So the authorities of those countries and other suchlike ones are rather peeved at the extra expense caused by the through traffic. Solutions have been mooted from special tolls for heavy goods traffic, to transporting the heavy traffic on through trains from one end of the country to the other. This is the solution that the Swiss, among others, have adopted. Great Britain, on the other hand has been largely immune to such problems because of its geographical position within the European Union. We are on the outskirts of Europe sharing this area bordering the Atlantic with Ireland. Both the northern counties (part of the United Kingdom) and the southern (the Republic of Ireland) import and export goods.A large number of these goods originate in/ are destined to Great Britain. However, an ever increasing proportion, and total volume, originate in/ are destined to other members of the European Union. Obviously, some goods are transported worldwide direct from/ into Irish ports, be they Belfast or Cork, by ships or aircraft. The vast majority, though, is transported by heavy lorry. 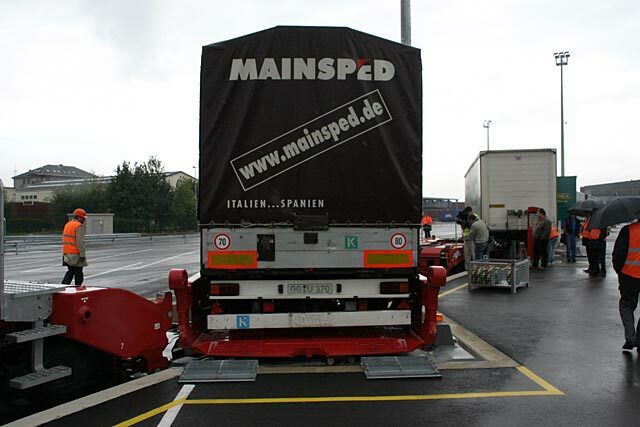 To transport such loads of goods to France, The Low Countries, Germany and elsewhere, there are only two alternatives. The first is to transport them on ferries directly from Ireland to France. This is already done by "Celtic Link", "Brittany Ferries" and "Irish Ferries" operating from Cherbourg and Roscoff to Rosslare and Cork. The problems with these connections is that they are long and arduous, especially in the winter gales in the Celtic Sea. The longest journey is from Cherbourg to Rosslare at 18hrs.30mins. while the shortest is at 13hrs.45mins. from Roscoff to Cork. These times mean that frequent trips are not possible being in total 8 sailings (in each direction) per week. The volume of traffic thus able to be carried is very limited. The second, and only realistic, alternative to transport high volumes of goods traffic between Ireland and Great Britain is by using the direct ferries, be them to/ from Scotland, England or Wales. These lorries then progress to their destinations in Britain or cross the country to the east(or south) coast ports to continue their journey to mainland Europe; Newcastle for Scandanavia, Felixstowe for Holland, Dover for Belgium or France and so on. However, it is much more convenient, these days, to use the Channel Tunnel. Thus we come back to the original question. Do we want or need to accept that lorry and car traffic from/ or destined to Ireland should clog up British roads (and with all that entails)? If we look at the realities of the situation then we can see that there are a lot of negatives apart from, noise, fumes, road wear, cluttering. How much is actually spent in GB on road tolls (nothing), petrol (only what is necessary), accommodation (only when part of a stop-off journey) food and drink(only when the time spent is excessive), other services(only when and where unavoidable)? The authorities should then be thinking about putting the Irish traffic on rail from the west coast ports to the Channel Tunnel (and through it). This way it is taken off the roads and whisked through the country so that it does not affect us(negatively).Therefore, we have to look at the systems being used elsewhere. The alternatives to driving along British roads are several proven systems. Obviously here we are talking about transferring the lorries on to rail wagons (cars are less of a problem since they are lower and not so wide).The greatest problems envisaged are the loading gauges (height and width) of the resulting wagon loads. Can the present (or future railways) accept the proposed loading gauge of the railways? Is there a viable system, tried and proven? 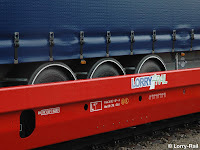 LORRY-RAIL is a company set up to carry unaccompanied semi trucks on the rail-road link from Bettembourg (Luxembourg) to Perpignan(France) (near the Spanish border)(1050 kms. )in one night only. This service opened for operation in September 2007. Here the trailers are put on the special swivelling wagons for transport. These have an extra low floor, only 22cms. 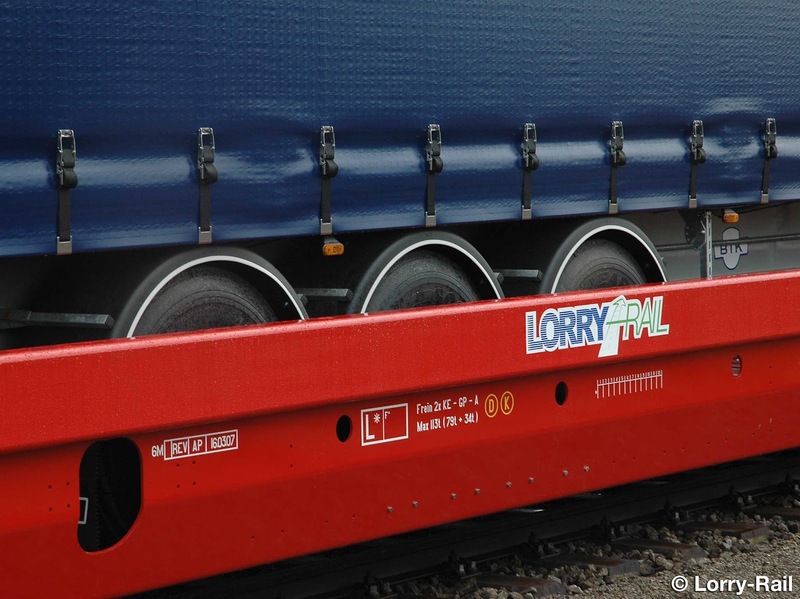 above the rails, meaning they can easily carry standard 4 metre semi-trailers on UIC GB1 gauge rails. These are recognised as the minimum European gauge. The advantages of this system are that less "dead wood" (the traction units) is carried and so more space is occupied by freight itself. The disadvantage is that any transport company would need traction units at both ends of the line - in itself a wasteful exercise and most likely not practical. Another system is that used by ÖKOMBI - RAIL CARGO AUSTRIA. This is the ROLA (rolling highway)system of roll on-roll off uniting road and rail transport on specially dedicated trains. 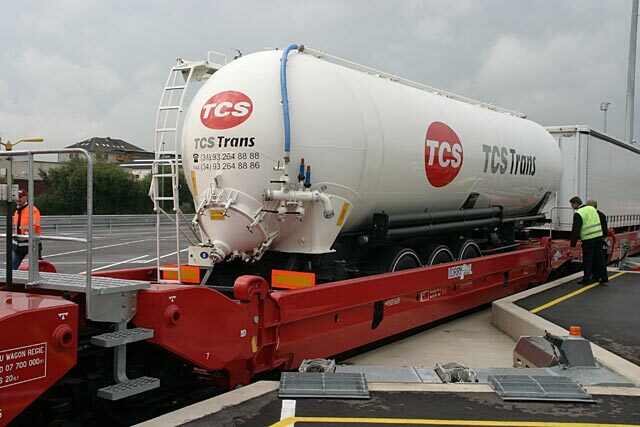 The lorry is driven directly on to the special low-loading wagons and driven off at the destination of the train. All a relatively simple operation. During the ride, the truck drivers can relax in a "recreation wagon" staffed with service personnel. This company provides a network of seven routes from Germany and Austria to Italy, Slovenia and Hungary. 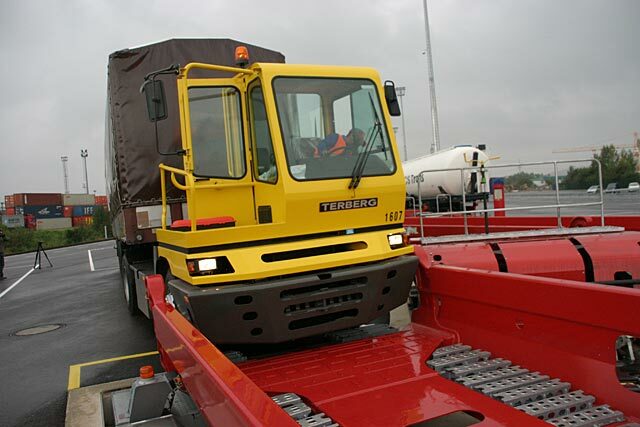 Among the conditions mentioned are that the lorries must not exceed 40 tons in weight, 2.6m. in width and 4m. height, with a ground clearance of at least 17cms. (though exceptions are possible). Of course, nearer home there is a service which exists already between Folkstone (England) and Calais/ Coquelles (France). This runs through the Channel Tunnel and is owned and operated by Eurotunnel. Eurotunnel Le Shuttle is a shuttle service between Calais and Folkstone conveying road vehicles by rail. Passenger and freight vehicles are carried in separate shuttle trains.The carriages used for the shuttle have a larger loading gauge than either British or French railways thus they cannot travel outside the tunnel and the two terminals. However, there are vehicle restrictions shown (and explained) here. 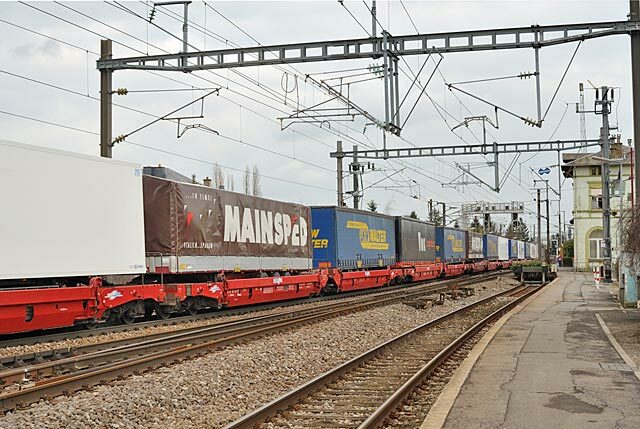 The main loading restrictions are mostly because of the different specially built rolling stock to provide a service through the Channel Tunnel which is not only fast and frequent but also efficient for lorries, coaches, cars,motorcycles and foot passengers. On that page you can see the different vehicles used for lorry and passenger shuttles. The larger vehicles are double deck shuttles for cars and motorcycles, which obviously require much more room (height) in the tunnel. The respective drawings are small but do show the distribution of the different vehicles on the different shuttles. What does all this mean for our Irish traffic? Well we have to find a way to transport all those lorries (and cars, why not?) from the west coast ports connecting us to Ireland and the Channel Tunnel. The only real alternatives for use on the west coast are at distances which are not too far from the Channel Tunnel while the crossing to Ireland is the shortest so as to speed up the transfer of the vehicles as much as possible. That understanding would eliminate the use of the Scotland-Ulster crossings and the long ones from Liverpool, Fleetwood or Heysham. We are left with the alternatives of Holyhead in North Wales, while in South Wales there are Pembroke and Fishguard. The latter provides the shorter crossing to Rosslare. Using Holyhead means running up the WCML (West Coast Main Line) or the new HS2(High Speed 2) (when and if built).From Crewe to Holyhead there is no problem with more traffic but south of Crewe there will be serious problems. The WCML is the busiest rail artery in the country (and probably Europe). It is calculated that it will get saturated in the next decade(if not before). Even if HS2 is built then it certainly will not be ready till 2025 at the very earliest. What, in any case, has to be faced is the connection from the Channel Tunnel, along HS1 (to London) and then to HS2 or the WCML. At the moment the connection is seen as right through the centre of London from the area of St.Pancras to the area of Euston.This short stretch of line is known as part of the North London Line and is a narrow bottleneck. It is shared by local stopping trains and both regional and long distance freight trains. And that is without considering the envisaged use of this bottleneck to help run passenger trains from north of London to mainland Europe. This is trying to do things on the cheap (and never works out the way envisaged) and is sheer and utter madness. The shorter and easier route is to South Wales to connect with Fishguard. Then we have our destination, Rosslare by ferry, from our transit port, Fishguard by train from our entry point at Folkstone. Let us consider some facts. The line from Fishguard to London Paddington is part of the Great Western Main Line (GWML) built by the Great Western Railway(GWR) from 1838 to 1886(with the opening of the Severn Tunnel) by Isambard Kingdom Brunel. This great Victorian engineer had the foresight to build the line(s) to high standards so that they were straighter than other competing ones, to offer potentially smoother and higher line speeds using a broader gauge than most at 7ft.(2.13m.). This was eventually changed to standard gauge (1.435m) in 1892. The result of that construction was that the lines supported a broader loading gauge that other lines constructed in the country. This GWML is now to be electrified from Paddington to Bristol and Cardiff. The cost was estimated at GBP 1000 million in 2010. Thanks to Brunel´s foresight the costs will be lower than on other lines(and certainly the WCML). There might well be a need to raise bridges(expensive) or lower tracks (a less expensive option) but the need to modify platforms or widen the distance between tracks to accommodate European compatible vehicles is less likely and only at some points. What will need to be done? The GWML will need to electrified from Cardiff westwards to Swansea and Fishguard. The port of Fishguard will have to be extended to accept longer trains and make easier transfers from ship to train for lorries and cars (not forgetting that this will bring new employment opportunities to West Wales). There is a problem at the Severn crossing due to saturation of traffic but no technical ones. (In fact the GWR introduced a car shuttle service through the Severn Tunnel from 1924 to 1966 when the bridge was opened. The rest of the line to Reading and London line is already approved. Here we have to look at previously made comments. As was stated before, taking the route through Central London means using the bottleneck of the North London Line to St. Pancras and HS1. This is just as mad as the previous option of using the WCML. But there is a second option which was mentioned in the previous blog. Ideas have been floated about a Reading- Heathrow link and another about a Heathrow-Gatwick link. This blogger suggested combining the two ideas into a Reading - Heathrow - Gatwick link. Also, and this is most important, there is no great problem of an extension from Gatwick to Ashford, and therefore, the Channel Tunnel. Thus a direct link from the Channel Tunnel can be offered to Fishguard, bypassing the bottleneck of London, providing a through route for (non GB) Irish traffic. We would thus have the desired connection from the Channel Tunnel to Fishguard, able to subtract the through Irish car and lorry traffic from our roads and at the same time offering a good, fast, safe,clean, environmentally friendly expressway across the country. Moreover, it does not necessarily stop there. To take advantage of the new connection an opportunity for GB traffic to use the same tracks can be given. An interchange near Bristol, where the GWML, the M4 and M5 cross, at Almondsbury could prove a collecting point for British traffic (from South Wales, the West, the South West ) to offer a similar complementary service along the SHSL to Calais (or Lille even). Our thinking should not stop there, however. The GWR was built as a broad gauge railway from Reading, through Oxford to Birmingham. The present modification scheme envisages the line from Reading to Oxford being electrified. It is no great problem to extend that to Birmingham (or even just Coventry which is already electrified). Thus a similar collection and dispatch centre could be established for car and freight traffic near Birmingham. This would preferably be to the east so that traffic from the north and east does not enter or cross the city. Little Packington offers a site, near the airport, on a GWML branch, between the A45, M6 and M42. This is an example of an excellent Central England collection point to subtract traffic from the M6, M40 and M1 and so distribute the European traffic so that it does clog up the South East, reducing pollution into the bargain. An alternative site could be between Ladysmith and Bloxwich (north of Birmingham) where the M6 and M45 converge. Who should run the service? This is not a priority point as yet. The present regulations permit the setting up of companies as open-access operators for the running of specific services. These are similar to the cases of the passenger services provided by Grand Central or First Hull Trains in (part) competition with East Coast . There are, however, legal connotations with regards to the services provided through the Channel Tunnel by Eurotunnel. In that case it might well be easier and quicker to set up such services by giving Eurotunnel the initial franchise. In later years the benefits of competing services can be looked at. One last point about the destination. Might it not be better to make the destination somewhere in the area of Lille?. I know that this is for the French to decide but if you want to unclog the roads near Calais then we think it would be wiser to make any destination point somewhere south of the Tunnel where the distribution of traffic elsewhere the the motorway system is quicker and easier. We see that at (or near) Lille. Investment in infrastructure is done for reasons. In this particular case we want to take cars and lorries off our roads. We want to reduce noise, road wear, pollution and congestion. We most certainly want to make an investment worthwhile, whether it be for economic, social or environmental reasons. Also it is paramount that such projects are feasible. This idea of a fast rail route through South Wales to Reading, then via Heathrow and Gatwick airports and connected via Ashford to the Channel Tunnel certainly fits these criteria. This is much more so when we combine these criteria with the international, national and regional rail passenger services envisaged through the airports, as explained in the previous blog. What is now needed is political willingness and effort to see the projects through to completion. Let it be so.